Timetable of the European Software Conference for the Independent Developer and the (Micro-) ISV-Industry. Blending web & mobile & desktop into one world of software. Every year it is a pleasure and a pain finding the speakers and their companies and redacting the vast amount of ideas and proposals to a meaningful composition of topics and covered fields of interest. Our software industry changes quickly and progress is demanding a continuing movement and hunger for learning. It is that evolutionary climate where the SMBDev feels at home. His flexibility and ingenuity is the ferment of change and reaching out is the fundament of multimillion actions by corporations. So there are now speaking proposals possible for the 14th European Software Conference in case you want to join our ride towards the future which definitely will be dominated by the Software Industry and the community we represent as SMBDevs or (Micro-)ISVs. Please ask for the tables for the ESWC. * Everyone pays for his own food and drinks beyond the sponsored ones which will be pointed out at the event in detail. Please send a short note to info <at> euroconference.info so that we can figure out the rough number of seats we need. It is quite a task to keep up with new trends, platforms, and earn money. Some observations. If done right, Outsourcing is a great way to get more things done faster and take your company to the next level. This talk will describe the authors mixed experiences with outsourcing software development and marketing. He describes what approaches worked for him, and what not (and why). Stop chasing for better positions in search engines! The actual reason why people buy your software is its functions and its quality. We thought our software was a good one, until we decided to get more serious about its quality. These steps included: finding obvious bugs and ensuring with automated GUI tests that we wont make these stupid mistakes in the future; increasing the number of contact points with our users; converting ourselves into users and improving user experience. In the name of the Mayor we will present the Epsilon Award to the winner. It doesnt matter if you believe or do not believe in the idea of Michael Porter about strategic focus, you still need a strategy. A strategy is not about business dreaming - it is about formulation of your business insights in the form of specific business objectives on the strategy map. The strategy map will help you to understand what you are doing, it will help to clean up and prioritize your to-do list, and it will help to explain to your team what matters and how exactly you want to achieve that. Lets discuss a strategy for your software project! */+Event- und Networking-Dinner-Conditions: At 07:30 pm on Saturday and at 08.:00 p.m. on Sunday until latest 11:00 p.m. there will be the networking dinner at the Conference hotel. These two networking dinners (with one beverage) are included with the full conference registration. After this networking dinners there will possibly be additional events that are free to access for all participants. These events are either planned and payed for in coordination with a sponsor or solely by the ESWC e.V. If planned by the ESWC e.V. you pay what you eat or drink (especially at the Friday Pre-Event). The relevant sponsor or the individual participant at events where you pay what you eat or drink is responsible for the event itself. No member of the ESWC e.V. or member of the board can be made responsible in any legal form. All legal claims towards the ESWC e.V. or any appointed representative of the ESWC e.V. concerning personal or injury or damage or loss of property or belongings, or due to natural catastrophies, accidents or terrorist actions - are excluded. By taking part in these events every individual participant and any company or business entity declares its consent to these conditions. Any registered participant may take part in these events. Additional persons (friends, spouses, partners, family etc.) receive - on written request - an access badge free of charge, that is exclusively valid only for the concerned event. Only through this written note the participation of additional persons is possible. Please register additional persons until October 15, 2017 by writing to event <at> euroconference.org. Please keep the confirmation by the ESWC in printed form with you. Thank you very much for your understanding.! *The compilation of our schedule is an evolutionary process in its best sense, since it is open to suggestions and ideas of creative people like you. Therefore changes and alterations to this schedule may happen without further notice. 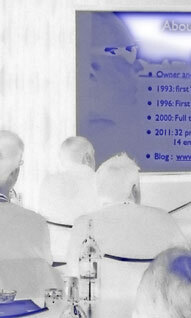 Speaking proposals for the 14th European Software Conference are open for any qualified speaker. We need a short outline, a topic and a three-liner text. Please note that we do not pay for travel or hotel expenses and expect any speaker to register. Please send your application to: software <at> email.de. working life. I certainly hope to attend future conferences. I just wanted to congratulate for the perfect ESWC conference this year. It has been a real pleasure to participate and there have been plenty of well performed presentations. Again thanks a lot for organizing this event. I'm looking forward meeting you again next year. The ESWC (e.V.) (Court Reg. Nr. 77 VR 1319) is a not for profit association devoted to providing educational opportunities to software developers and the (Micro-) ISV-Industry. Details.